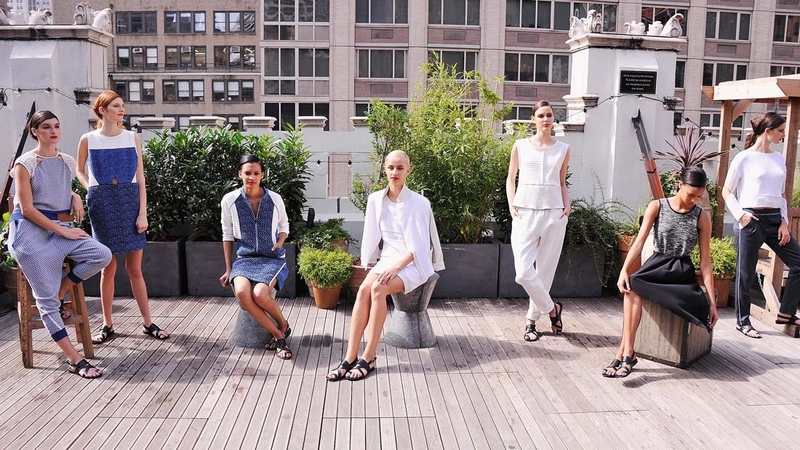 For her Spring/Summer 2015 collection, Ann Yee was inspired by New York City’s unstable weather patterns, particularly that unpredictable time of year between late winter and early spring. “The romanticism of a stormy spring meets mixed media,” said Yee at Refinery Rooftop where her Spring/Summer 2015 collection debuted. To coincide with the clothes that featured malleable textures and clean lines, Aveda Guest Artist Jon Reyman created a sleek style that morphs into a rhythm of fitful waves coming together briefly off center, only to expand out into a full ponytail. “The super straight top that develops into rapid waves speaks to Yee’s vision of that time of year when an urban dweller is suddenly faced with a storm that can be forceful, moody and exhilarating,” Reyman said. Step 1: Create a strong side part on the left side of the head and divide hair into a left, right, and back section. Step 2: Prep the sections with Smooth Infusion Naturally Straight and blow dry directing hair away from face. This will add the straightness needed in the front. Step 3: Once straight, mist hair with Control Force Firm Hold Hair Spray. Working horizontally from one side, wrap sections of hair around large U-pins in a figure-8 pattern. Secure each with a small clip. Step 4: Hold each secure clipped section with a flat iron for 10 seconds to set shape. 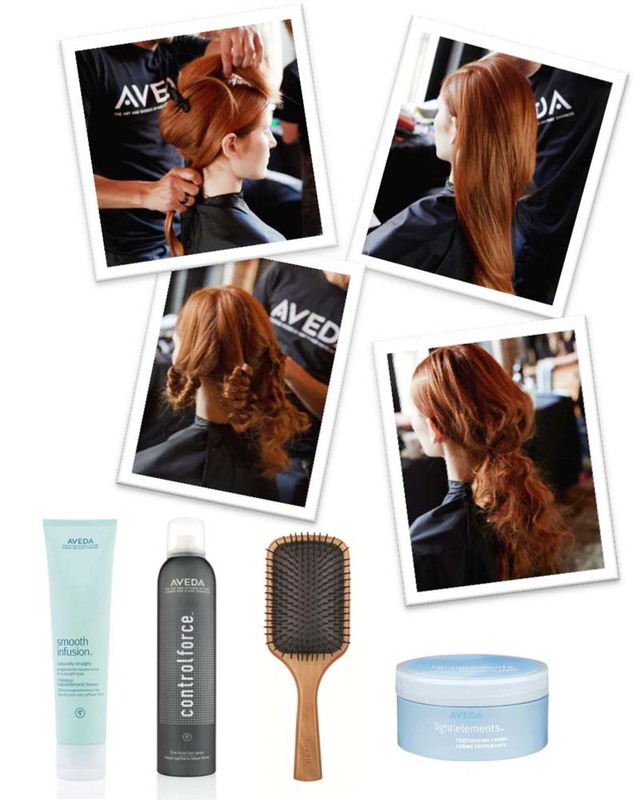 Once cool, gently release the pins and brush out hair with an Aveda Wooden Paddle Brush. Step 5: Work Light Elements Texturizing Creme into the waves with hands carefully maintaining definition, while also smoothing down the top of hair at the crown. Step 6: Pull the sides of the hair back to a meeting point that is just left of center, secure sections with a clear elastic. Take a bottom section of hair at the nape and wrap around the elastic and secure with a pin. Step 7: Finished with Control Force Firm Hold Hair Spray. This entry was posted in Aveda Collection and tagged artistic team, aveda, collection, Damaged Hair, dry hair, fashion, Hair Tips, lifestyle, Mount Dora, mt. dora, Pure, pure aveda, pure aveda salonspa, Salon, Smooth Hair, style, Style Tips, Tips. Bookmark the permalink.